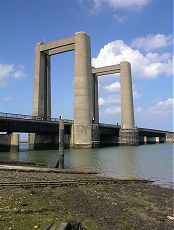 This is a 40 mile race clockwise around the Isle of Sheppey, starting at Sheerness, with sea, river, and estuary tidal sailing. It has been going since 1959 and is the longest dinghy race in Europe. 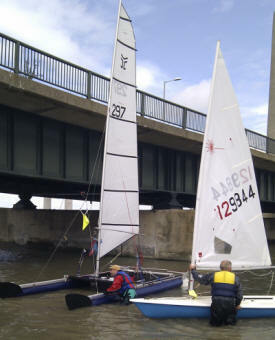 The race is in fast sailing water (with the land low-lying for the stretches through the Swale Estuary.) Catapults Chris Phillips and Alastair Forrest took it on for this year, starting in the fourth fleet (an hour and a half after the slow dinghy fleet headed away.). 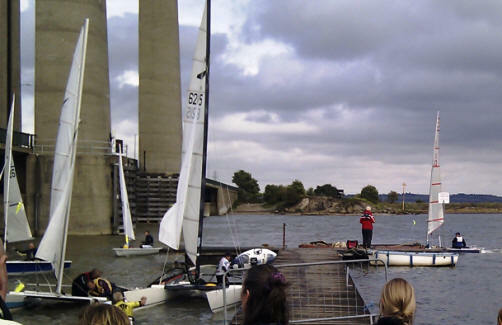 A Force 4 southwesterly made its predicted rise to Force 5 as the race kicked off. 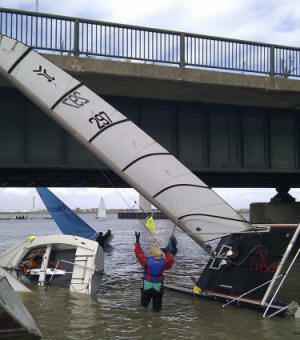 One big cat nosedived on its way to the start line (recovering from being in past the mast) and a Dart 18 dived and rolled a minute into the race. The two Catapults made uncontested reaching starts and a fleet of 33 cats took off on the first leg. This long stretch on most other days is liable to drag (the headland marking the first turn seeming to come no closer) but this time it was eyes down and a focus on the bows rushing at the next two waves ahead. The two boats kept closely-matched speeds, slackening the main in the gusts, both probably able to be pushed harder (as driving through the short waves gave little sense of an impending dive) but with 37 miles to go, and open water, dumping power made sense. Chris luffing up a little to the headland moved ahead and after a brief period in the headland wind-shadow the boats tore into a broad lead as the wind came over the flat SE corner of the island. The broad lead turned gradually tighter, following the rest of the fleet well out from the SE corner shoal (where a Dart 18 ahead lost its rudder 200 metres out to sea) and then shifted to hard on the wind across the mouth of the Swale estuary. 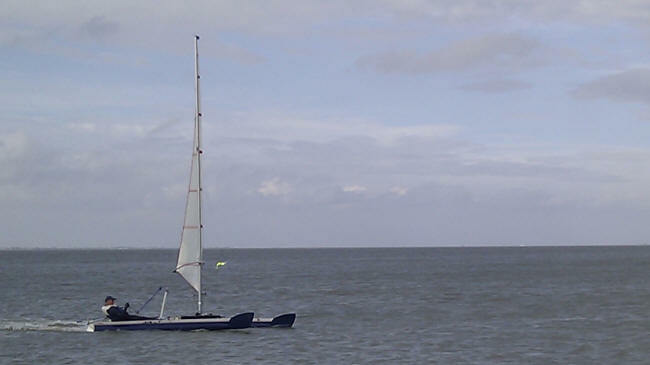 Both quickly decided that the short steep waves (from a sharp incoming tide against the strong wind) made trapezing too risky, and slammed their way across the Swale, seeming to be slow, although the overall time (40 miles in 3 hours) says otherwise, and the tide was at least friendly. Alastair had the humiliation of three times missing the far side tack onto port (perhaps showing the big advantage of usually tacking from the trapeze in this weight of wind) but this at least carried him right over to the Kent shore and flatter water where trapezing became the clear option. The course allowed a very long port tack hard on the wind up the Swale, and he pulled up and over Chris (not trapezing in the waves further out in the stream.) The waves again picked up as Alastair very gradually sliced across to the island side, but trapezing remained possible and he built what seemed an unassailable lead as the river narrowed. However, Chris was then able to point up and avoid a final two tacks and was a minute or two behind as they entered the turmoil of running into the shallows under the bridge where marshals chest deep in the water struggled to control the inrushing boats and assist tipping and walking through. After the bridge, reaching fast in flat water and then gybing through the �s� bend to Queenborough, Chris surged up and was level through the anchored boats, the Catapults 10 yards apart after 30 miles of racing. For the final mile now on a broad reach, the Club seemed close enough to risk driving the boats harder, until Chris nosedived, bobbing safely back up but allowing Alastair to gain 50 yards and cross the line 12 seconds ahead. The Catapults did the 40 miles in 2 hours 58 minutes (including 10 minutes under the bridge) 40 minutes faster than Alastair�s last time in 2008. A Hobie Wildcat, the first cat home, took 1 hour 52, a new record. They were 34th and 35th overall, out of the 86 finishers. Alastair in three outings has results of 35th, 34th, and 34th, so his initial steady improvement seems to be plateauing. 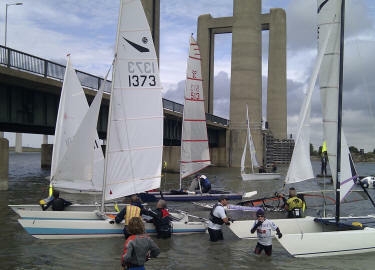 This time the race seemed long at points when fatigued, but over in flash once hitting the shore again.